The World Expo in Shanghai is an international display of a country’s culture and initiative to be “greener.” Additionally, Expo serves as a window to the world for many of the Chinese citizens who have never had the opportunity to leave China. The Expo cleverly sold passports, and after visiting each pavilion, visitors would get a stamp. This became an abridged version of traveling to another country: waiting hours to get into the pavilion, going into the pavilion, shop the for the country’s goods, and finally receiving passport stamp before leaving. Many of the Chinese people held passports and booklets to signify their visit to the pavilion, and sometimes rushed to the next without enjoying the pavilion after their 2-3 hour wait. As a Westernized Chinese individual, I could not understand if these people see the Expo as an amusement park, a race to get all the stamps, or actually “visiting” a different country. I started at the USA Pavilion because of the fast access my American citizenship granted me. I needed to see America’s effort (or lack thereof) in exhibiting “sustainable” practices and our diverse culture. Upon entry, there was a wall full of sponsor names that helped finance the pavilion. Next, there were three videos within the pavilion describing the American relationship to China, future of American green technology, and an “urban garden” vision bringing a community together. The conclusion of the pavilion was a sponsor interactive media room and gift shop. After going through the pavilion, I pondered about its perception from both an American and Chinese point of view. 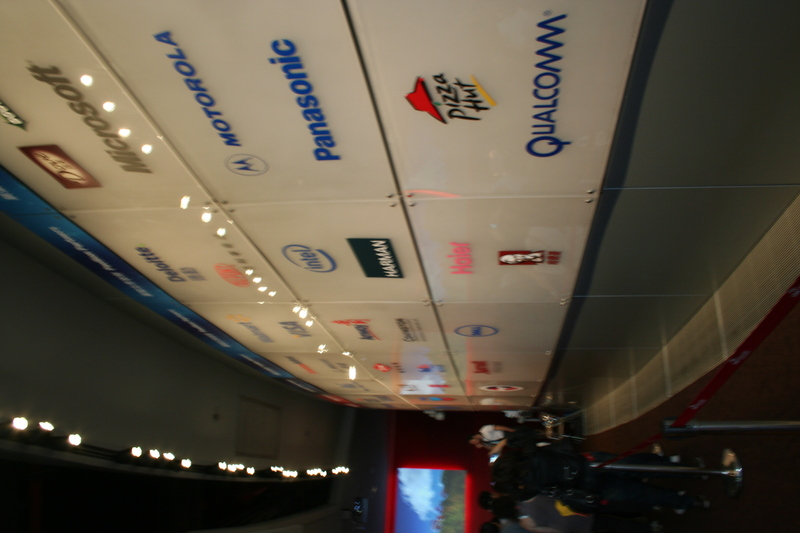 As an American, walking into the first room and seeing a whole wall of sponsors, I dubbed it the Wall of Shame. If it was to test my skills of brand recognition, I passed with flying colors. It became justification that the United States didn’t see this as an opportunity to show the world, especially to China, how much it has advanced. Other pavilions had their sponsors very discretely displayed because the pavilion is the representation of the country, not the corporations. By placing the sponsor wall at the entrance and extremely large, we were embracing each company’s contribution to this wonderful. Is America’s intention to show an array of corporations making the world “greener?” I am skeptical that these companies have strived to find ways to make the cities of America better, nonetheless the citizens having a better life. Rather than watching the introductory video, I stared at this wall shaking my head in disappointment. To the Chinese, the wall seemed irrelevant, and just making it into the USA Pavilion after a 2-3 hour wait was enough to make them wide eye in awe. The Chinese speaking Caucasians were also an exhibition in itself. The video in the second room seemed optimistic by having corporate leaders acknowledge the importance of childhood dreams, imagination, and creativity. It is true that children are important for their unhindered creativity and ideas, but my attention was drawn towards the speakers of their company logo blurred in the background, but still blatantly recognizable. Corporations like Pepsico and GE were telling me embrace childhood creativity, but why have I not even seen anything remotely close to advancing America’s overall sustainable practices? The final video portrayed a girl dreaming of a community garden and attempting to rally her neighbors to participate. It was an optimistic message to the Chinese people who may not have seen or experienced an American neighborhood before. I was skeptical that a community garden was able to spark a whole new movement of making a gloomy city into one with roof gardens, greenhouses, and planter boxes. USC does it’s civic duty in South Central Los Angeles by heavily advocating ONE community neighborhood help day. The video portrays an unlikely circumstance that superficially makes a better city and a better life. In the last room before the gift shop, many sponsors were allocated a portion of space to display interactive tools to exhibit green initiatives such as solar collection and wind harvesting. I expected the last room to show something about our culture, cities, or states, but there wasn’t. America has 50 states, and I half expected that at least one state would make it into the pavilion. Is America then all about the corporations and how proud we are to have them represent our nation? My disappointment with American Pavilion is only a small piece of a larger issue. Many countries see America as a land of great opportunity and our country flaunts that. However, its allure is starting to fade as China starts to develop. In order to gather the remaining funds to build the pavilion, China had to intervene and find corporations that had a stake in China. The United States has failed to use this as an opportunity to show and prove its mighty image. This pavilion did more harm that good to the image of the United States, especially when compared to our European counterparts. The pavilion’s lackluster appearance and interior content made me feel terribly guilty that these Chinese people waited hours in line to see something so unsubstantial and uninformative. In no way do I hate America, but rather, I am concerned of its global image especially in the eyes of developing China. If the United States does not change its blaze attitude about its global image and progress, it will most surely fall behind and lose its “prestigious” status. Following Yo’s lecture this morning, I found myself questioning the meaning of “real”. During the discussion, real was loosely defined in terms of the natural vs. man made. Take a landscape for example, in a dense urban environment such as Tokyo. You can almost always assume that it has been designed by man. This tree was put here on purpose. Seldom can you find a “natural” landscape within a dense concrete jungle that has been preserved in its original state. But does this disqualify it from being real? I would say no. Later in the day, my friend and I were arguing over the same definition, and I came to the realization (no pun intended) that real can be defined in the sense of perception. We recalled a professor’s lecture about imitation designer hand bags. The “real” bags are produced in China, and then the Chanel/Coach/Louis Vuitton label is added afterwards before reaching the US for sale. The “fake” bags are produced in the same factories, by the same workers, with the same materials. They are then sold on the street without the designer label for a tenth of the cost. The only reason we consider the bags in the designer stores to be real is because of our perception of the label. So why can’t this apply to architectural constructs? If we as designers can fashion a landscape so as to prompt a certain perceptual understanding from the user, we have essentially created something real. If the user thinks and feels as if they are in a natural environment, than to them it is real. “If real is what you can feel, smell, taste and see, then ‘real’ is simply electrical signals interpreted by your brain.” In this sense, real can only be defined by the self, thus supporting the perceptual defenition of the word. I have also observed how this “perceptual reality” has become an integral part of the Japanese culture, and how it applies to both the city and its architecture. As we all have noticed and marveled over, a large part of Tokyo city life occurs beneath the ground, on multiple urban sub-levels. One particularly interesting aspect of this subterranean network, is that often times you hardly even notice that you are underground while occupying them. They have been designed to imitate a real surface city, and include many of the same programs and circulatory patterns. With the use of voided atrium spaces to bring in natural light and air, it becomes hard to tell the difference between above and below ground. In essence, the view of this underground system as an integral part of the surface world, rather than a separate sub-level, creates a perceptual reality of a singular, unified city network. Juxtaposed to American cities, this is quite unique. In cities with underground systems such as New York and Washington D.C., there is a clear distinction between above and below. Sub-level, there only exists the transit systems, with little program or other uses, and there is rarely a moment which blurs the line between the two distinct worlds. Lastly, our screening of the film Tokyo-Ga also reinforced my understanding of a perceptual reality within Tokyo culture. This was largely supported by the artificial food replicas that appeared throughout the film. 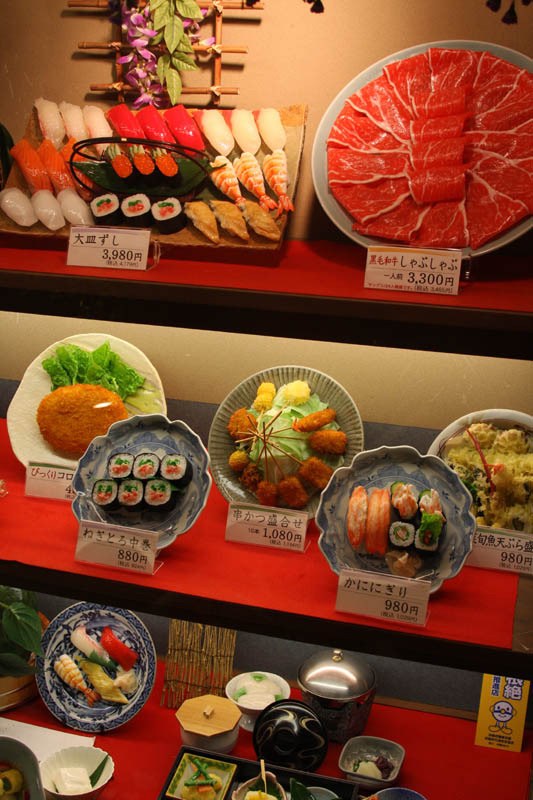 In nearly every restaurant, you can find a plastic food display in the window, or at least a photographic menu of plastic foods. This example is about as purely perceptual as you can get. You order food based on your perception of the fake as the real. For six days now, I have not once ordered a meal based on the English description of the dish, but rather by how appealing the picture or plastic food appears. Another perceptual reality found in the film is that of the golf world. Since Tokyo does not have the luxury of space that America does, there is no room to construct an 18 hole golf course or 400 yard driving range. The solution lies in perception. If you can see, feel, imagine you are playing the game, than it becomes real. This is best illustrated by a shot of a man in the film, who stands atop his apartment building, dozens of stories high surrounded by other structures on all sides. The nearest park is probably miles away, let alone a golf course. Yet he practices his swing, clutching a rolled newspaper as if it were a club, driving imaginary balls into the urban abyss. For him, this is probably about as real as golf will be for quite some time. In a city like Tokyo, it is almost necessary to accept this perceptual reality, for it allows one to live and experience things that are otherwise inconceivable within such a dense urban fabric.